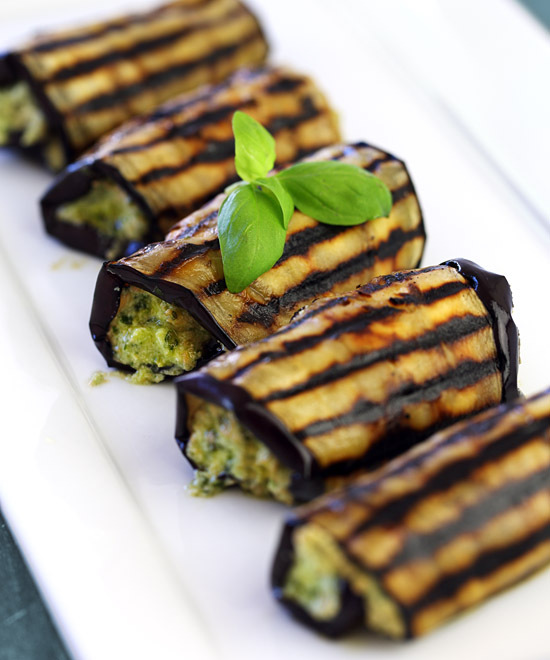 A combination of robust herby pesto and creamy ricotta rolled up in slices of smoky, tender grilled eggplant. 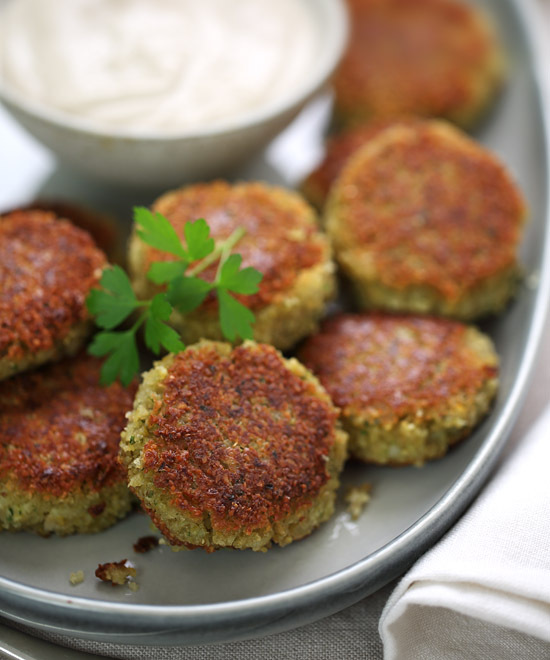 Fish cakes are a popular appetizer and snack in Thailand. 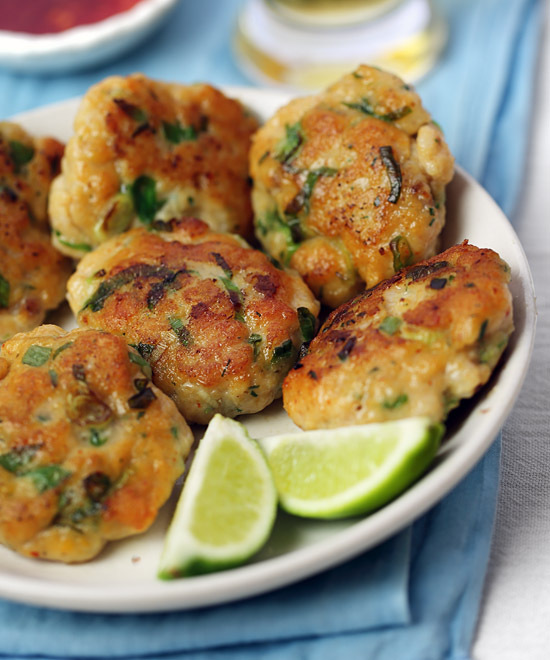 In this recipe, delicately spiced fish cakes are served with a sweet chili-lime dipping sauce. 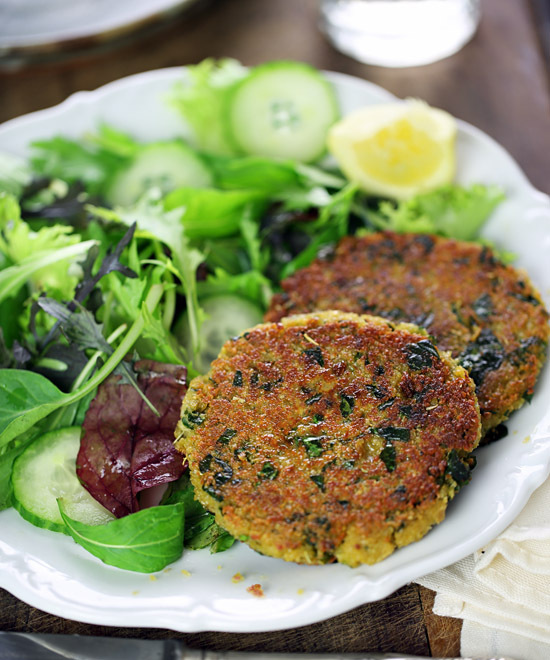 Mouthwatering little pan-fried patties made with red lentils, onion and garlic, and seasoned with oregano and fresh parsley. 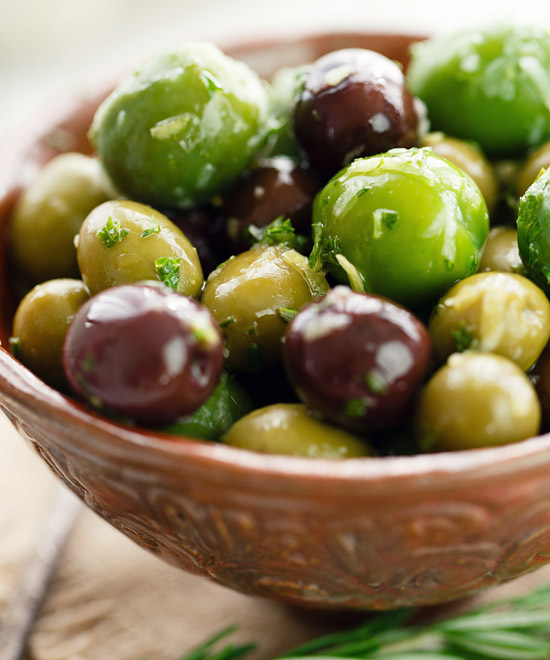 Perfect served as an appetizer with tzatziki or tahini sauce for dipping, added to stews, or stuffed into pita bread with crisp salad veggies. 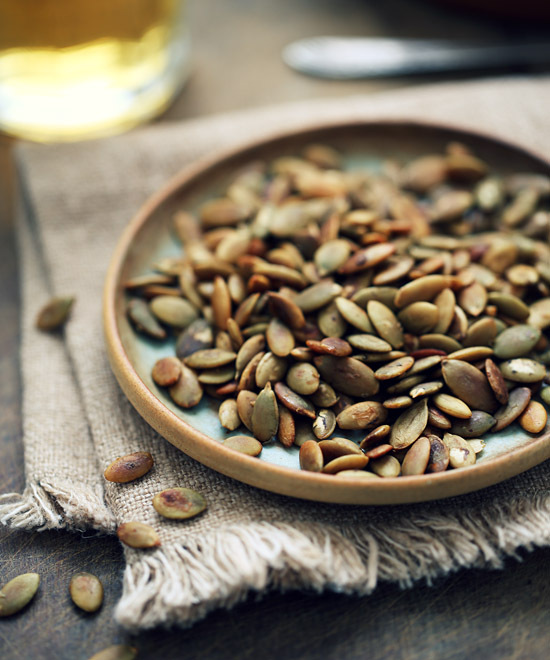 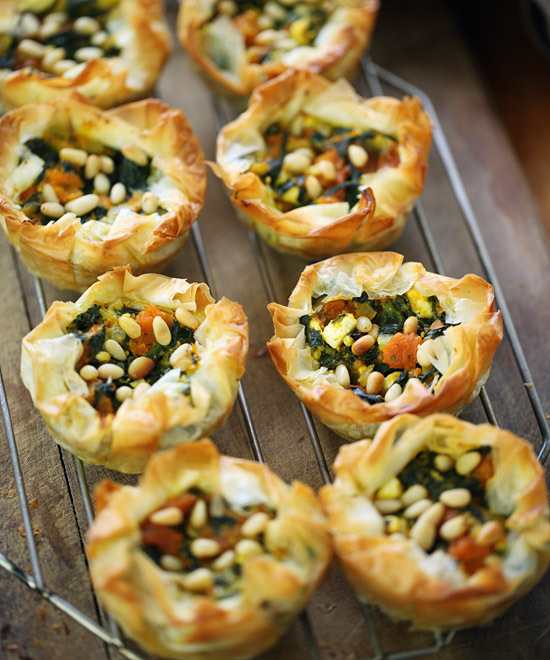 Roasted pumpkin, spinach and creamy feta cheese encased in delicate phyllo pastry, topped with pine nuts and baked until golden. 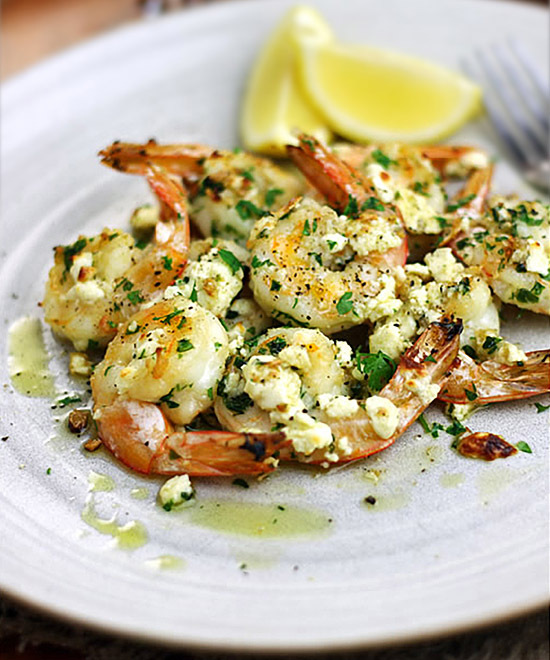 This Greek meze (appetizer) features succulent shrimp seasoned with garlic and flat-leaf parsley and served with crumbled and lightly broiled feta cheese. 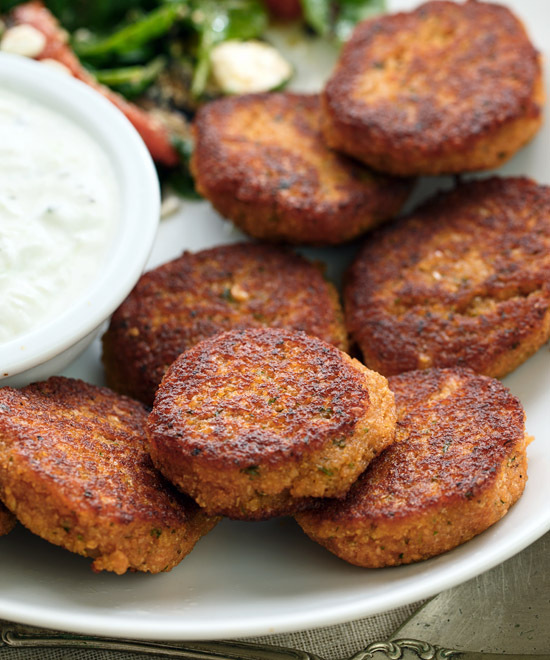 Delicately seasoned falafel (Middle Eastern chickpea fritters) served with creamy tahini sauce. 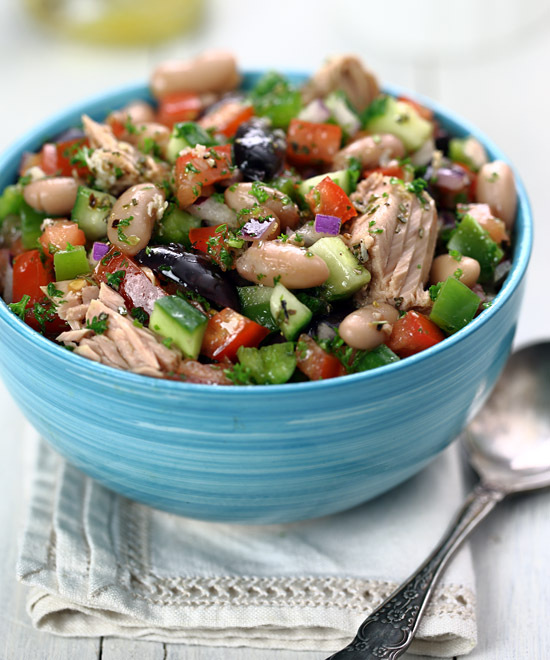 Enjoy in pita bread with crisp salad vegetables, or simply by themselves as a delightful appetizer. 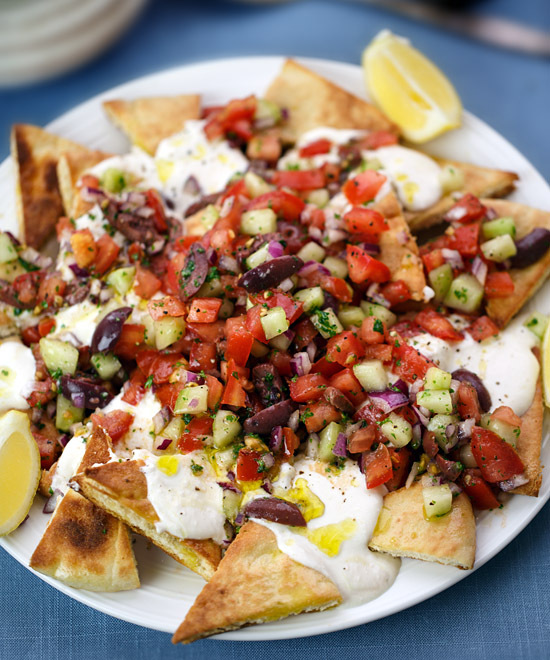 Baked pita wedges with dollops of feta and Greek yogurt whip, and topped with a Greek salsa of tomatoes, cucumber, red onion and olives. 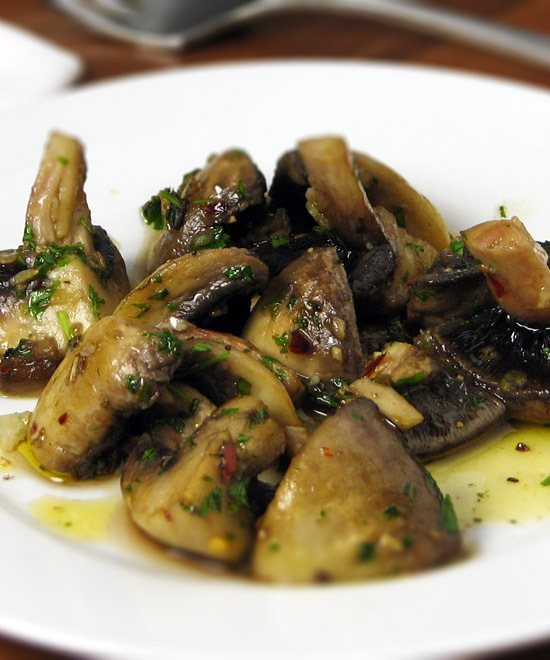 A popular Spanish tapas dish, champiñones al ajillo is mushrooms sautéed with garlic, olive oil, lemon juice and typically seasoned with flat-leaf parsley, salt, freshly ground black pepper and chili. 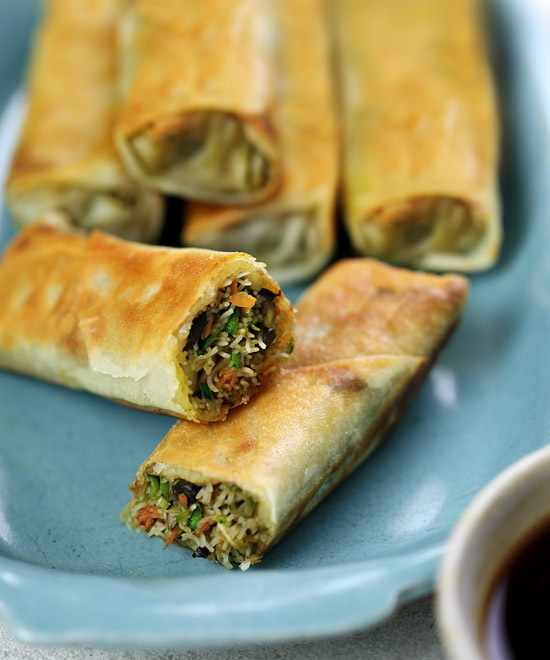 Crispy pan-fried spring rolls stuffed with cabbage, carrots, zucchini, mushrooms and rice vermicelli noodles. 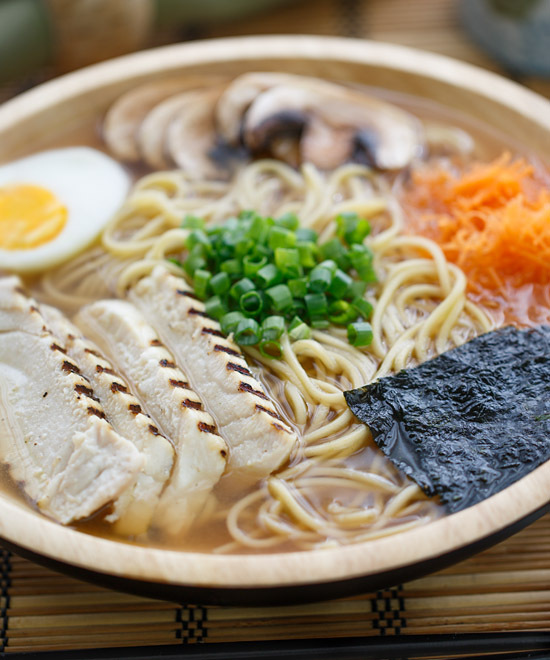 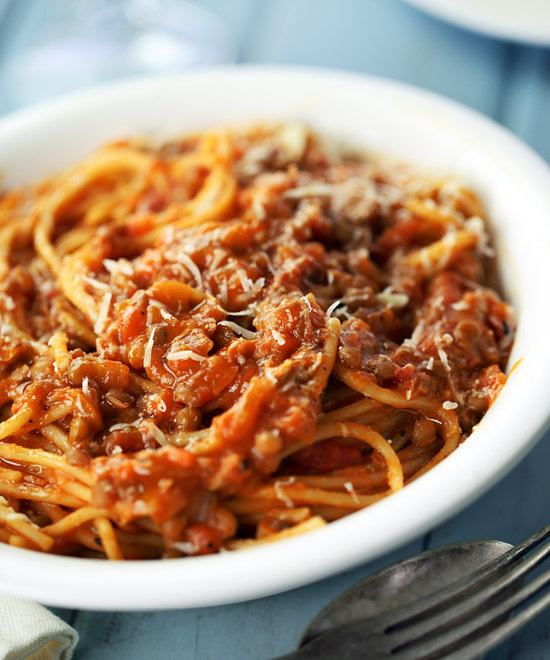 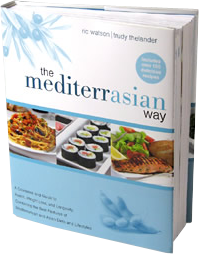 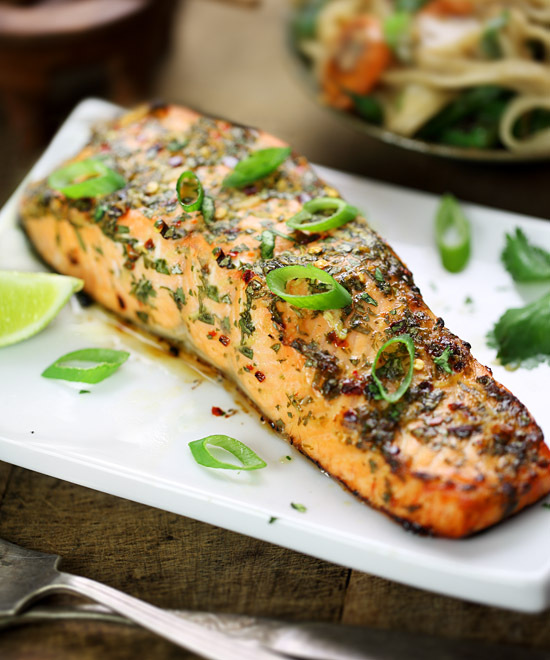 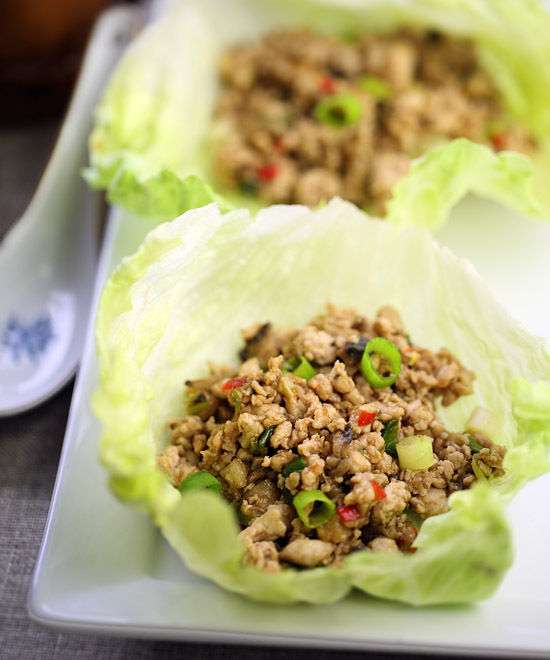 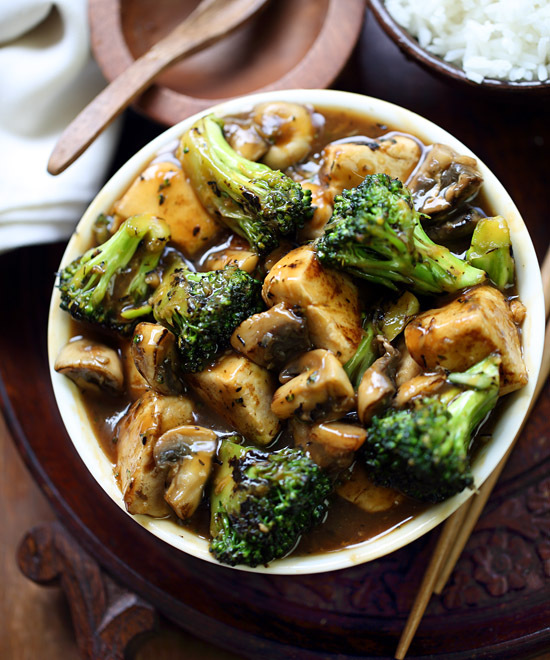 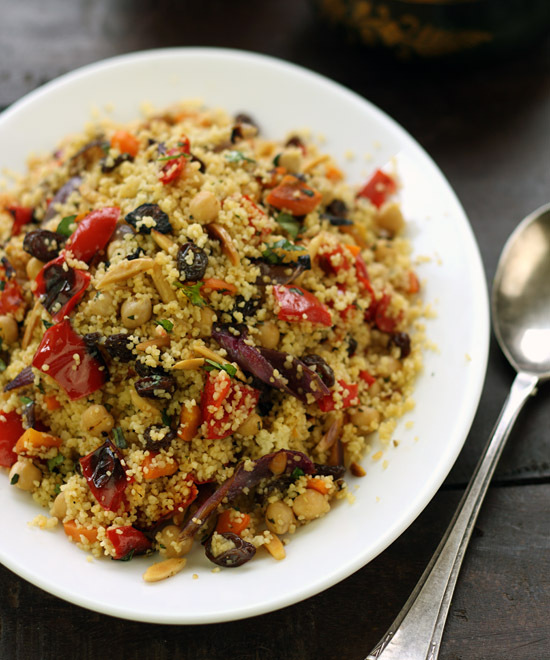 Cooked shrimp or chicken can also be added to the filling mixture for a delicious variation. 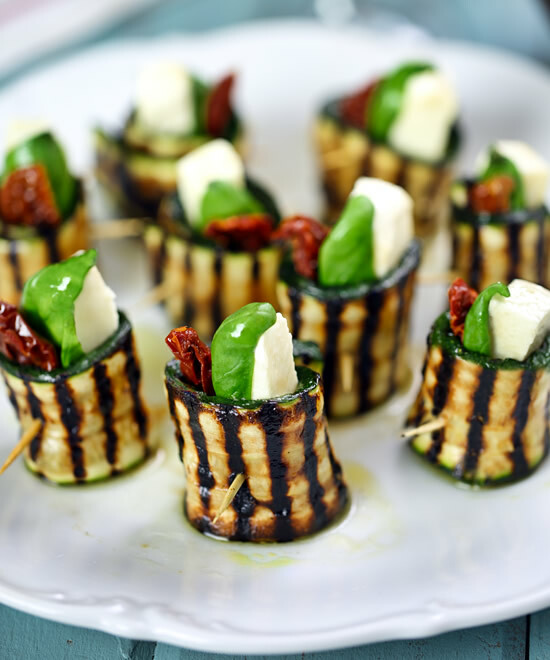 A combination of fresh mozzarella, basil and sun-dried tomatoes rolled up in slices of smoky, tender grilled zucchini.